Soon it would be done. Soon Toke would be dead, and Harald avenged. For we had a plan. I knew what Hastein had left unsaid. I was greatly changed from the boy who had sworn an oath of vengeance against Toke. I had gained much experience as a warrior in Frankia, and I had killed men─many men, counting all those my arrows had felled in battle. I had even killed Snorre, Toke’s second-in-command, in a formal duel. But Toke was different. I did not want to face Toke one on one. He was as strong and nearly as large as a bear, and very quick and light on his feet. And I was afraid of him. I had always been afraid of him, for as far back as I could remember. I did not believe I could best him in such a fight. “No, we must surprise and trap him with overwhelming force. Then, as jarl over the Limfjord district, I will call upon him to surrender. I will tell him I will take him to King Horik, to answer the charge that he wrongfully killed Harald and his men, and I will give him my oath that he will come to no harm on the journey there. Ivar and Bjorn will join with me, also─it will be no small thing, to a man like Toke, that two sons of Ragnar Logbrod are urging him to come peacefully and appear before the king. My own plan differed slightly from Hastein’s. I knew Toke. He would never surrender. He would fight us, even if he knew he could not win. He would rather die with a sword in his hand, killing as many of his enemies as he could, than allow himself to be taken without a fight. He would fight us, and when he did, I would put an arrow through his eye. Soon it would be done. We had landed at dusk a short distance up the coast from the estate that had once belonged to Hrorik, my father, and after him to my brother, Harald. Ivar and Bjorn had indeed come with us. They wanted to see the end of the tale Hastein had told the entire army at the feast that last night in Paris, before our fleet had left Frankia and sailed for home with the ransom we’d won. Hrodgar and the men from the village on the Limfjord had come, too, although some of them had grumbled at the prospect of further delay in returning to their homes, once they were so close. We planned to surround the longhouse in the last hours before dawn while the household still slept, trapping Toke and his men inside. Hastein and Ivar and most of their warriors were with me now, hiding in the edge of the woodlands that bordered the cleared lands of the estate. I’d led them there in the dark, through the forest that I’d hunted in so often as a boy. At first light, Bjorn, Hrodgar, and the rest of the men would bring the ships around to block any chance of escape by sea. I seated my helm on my head, twisting it back and forth with my hands until it felt comfortable, then tied the strap under my chin. I stood, braced my bow against my right foot, and strung it. Beside me, Tore did the same. I shrugged my shoulders in answer, and slipped the strap of my quiver over my head, so that it hung at my right hip with the arrows ready to draw. I searched through them and selected one I knew shot true. It had a heavy oak shaft, and was tipped with a short iron head with a square cross-section that tapered to a sharp point. I called such heads mail-breakers. I’d found a barrel full of them in a storeroom in the island fort that had been the home of Count Robert of Paris before we’d taken it and the town. I’d stowed a sack of the heads in my sea chest, and had mounted two dozen on my heaviest arrows during the long voyage back from Frankia. I touched my finger to the tip, feeling its sharpness. Recalling where I’d found it brought thoughts of Paris flooding into my mind. Where was Genevieve now? What was she doing? I remembered the last words she had spoken to me. She’d brushed my cheek with her hand, and whispered, “I will pray every day to my God to watch over you and protect you. I will pray to Him to shelter my love from wind and wave on your long journey back to your land.” Then she had turned and walked away without looking back. I shook my head, trying to clear it of thoughts of her. I could not afford to be distracted by memories of the happiness we’d shared so briefly then lost. I had a man to kill. Perhaps many. All of my thoughts must be on that for now. I led our force of warriors from the forest’s edge that lay just behind the crest of the low hill atop which the bodies of my mother and Hrorik had been burned and sent upon their death voyage—the hill overlooking the longhouse, from where we would launch our attack. It was here that Harald had found me, the morning after their funeral pyre. The burial mound within the standing stones that formed the outline of the death ship had grown a lush cover of tall grass since I had last been here. In the great feast hall of the gods, did my mother know what I had become? Did she think it was worth the sacrifice she had made? And what did Hrorik think now of his slave son? When he’d reached Valhalla, Harald would have told them of how he’d trained me, and of my first battle─the one that had cost Harald his life. But much had happened since then. Did my family know, where they dwelled now in the distant land of the gods? Morning fog shrouded the hilltop. We spread out into a long line, Hastein at its center. Torvald, Tore and I, with the rest of the warriors from the Gull save the skeleton crew who would sail it round from where we’d landed yester night, aligned ourselves to his right. Ivar and his men formed to Hastein’s left. Hastein’s two captains, Stig and Svein, with their warriors, anchored the two ends of the line, barely visible now in the morning fog. 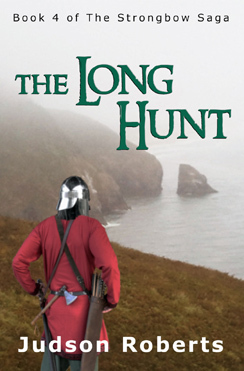 Hastein drew his sword, waved it overhead, then pointed it toward the longhouse. We moved forward slowly across the hilltop and down its slopes, like an army of ghosts gliding silently through the mist. When we reached the base of the hill, Stig and Svein and their men trotted ahead, curving the ends of the line forward to encircle the longhouse within a wall of armed men that touched the shore at either end. The trap was closed, and those inside were now surrounded. No one would be able to escape. Ivar raised his horn to his lips and blew a long, challenging call. After a moment, he blew it again. From out over the water, we heard another horn give answer. The ships, which had rounded the point and were waiting for the signal, would pull for the shore below us now that they knew we were in position. The door to the longhouse opened, and a head peered out. Seeing us, it jerked quickly back inside and the door slammed shut. I thought it lax of Toke that no sentries stood guard outside during the night. Even though the estate lay in the heart of the lands of the Danes, he was a man with enemies. For a long time, there was only silence. I spent the time recalling in my mind images of the longhouse. If we had to breach its walls with a ram, where would be the best place to attack? Hastein was not Toke, nor was I. We would not burn it with innocents inside. Gunhild lead the procession that filed out of the longhouse door. That I had not expected. As much as I hated her, I could not deny that she showed courage in doing so. Behind her, one by one, peering fearfully at us as they left the safety of the longhouse, came the estate’s carls, their wives and children, and the thralls who lived and worked on the estate where most of my life had been spent. Toke and his warriors were not among them. The three of us strode toward the open door of the longhouse. Tore and I had our shields slung across our backs and our bows raised and at ready. Torvald held his shield angled in front of him, covering his chest and neck, and he carried a spear cocked back, ready to throw. The moment when he entered the doorway would be the most dangerous. Tore and I would cover him as best we could. Something nagged at the back of my mind. I stared at the faces of the frightened folk huddled behind Gunhild and realized that Toke and his men were not the only ones missing. She’d looked pale before, but at my questions, the blood remaining in her face drained from it. It was not surprising she did not recognize me. The light was still dim─it would be a while yet before the sun rose─and my helm and its nasal bar obscured my features. And I was not the boy she had last seen. I was a warrior now. The boy who’d left here was now a man, wearing a shirt of Frankish mail, and a Frankish helm, with a fine sword hanging at his hip. The beginnings of a beard lined my jaw. And around my right arm was the torque of solid gold that Ragnar Logbrod himself had given me. I wore it now because I wished to make a strong impression when I first reappeared at my former home. I was no longer Halfdan, the former slave. I was the warrior Strongbow. Someone said, “I know that voice,” and a man in a shabby, soiled tunic pushed his way to the front of the crowd. “Get behind me, thrall,” Gunhild told him, but he ignored her. Gunhild staggered back. She would have fallen had those behind her not supported her. “But you are dead!” she gasped. The expression of wonder that had filled his face a moment before was replaced by a look of pain and fear. Your books are amazing! So well written with detailed history and a great story. Thanks, Alysha. Re: book 4, are you able to order print and/or e-books through Amazon’s Australia store? I don’t whether it currently serves New Zealand as well. Another alternative for the e-book version is Kobo–I do know they sell in New Zealand. After reading your question, I’ve also sent an inquiry to the company that prints and distributes the books, and asked if booksellers in New Zealand can order it directly from them. I know that’s an option in the UK and Europe, but I’m not sure about NZ. I’ll update this when I receive their response. Okay, Alysha, here’s what else I’ve learned. The printed editions are printed and distributed by a print-on-demand publishing company called CreateSpace, which is owned by Amazon. Non-US booksellers can apply at http://www.createspace.com/info/createspacedirect the open an account with CreateSpace, which will allow them to purchase any books printed by them at wholesale prices. I have no idea what the shipping charges would be, though. Hope that helps. Finally, after what seems like a decade of waiting. The fourth book is almost on it’s way out. Looks like I’m going to have to drop all my school work and start reading the series over again. 🙂 So excited!! Seriously?! Well a tragic family event occurred during this Christmas that seriously put me behind the eight ball. Just want to say thank you for writing this series. In fact I was just talking about how 4 years ago it helped me write my own 14,000 word story depicting me as the viking hero sailing to a foreign land to save my wife. Can’t express how much of a fan I am of this saga. I guess it would be trivial of me to say keep up the good work, but damn you’re doing great. Love these books. So sorry about your family tragedy. just finished it – brilliant…can’t wait for the next installment. I loved the bit where they were chatting about the Norms….. not sure about Bram though, he seems to know a lot of the baddies…..also, will we meet Serpent-eye again? Thanks very much. I’m not sure yet about Sigurd. Many details of book 5 are still very much up in the air, although I know the broad strokes of the story. I can’t wait for Long Hunt to come out! I first stumbled upon the series at my school library and I couldn’t put the books down. Thanks, Jocelyne. You do know it is out now, right? Me freinds call me Valkyrie for my beleif is that of the Old gods (the Norse gods) which is the reason why i love this saga. I have been studying runes & the old norse also known as old english its hard but what i find fun is learning every Norse curse & swear word. Thanks, Craig. VERY short wait now. Thanks, Cayla. That’s great that you’re writing a book. The only advice I’d give is keep working at it, and don’t get discouraged it it takes a while to perfect your skill. I wrote for ten years before finally getting a book published.